As Saturday became Sunday, boxing fans were still debating whether or not a robbery took place in Monterrey, Mexico. Not helping the debate any was the fact that the judges collectively weren’t quite sure what they witnessed in Jaime Munguia’s majority decision win over Dennis Hogan. Ohio’s Richard Levine scored the contest even at 114-114, but was overruled by scores of 115-113 and 116-112 turned in by Florida’s Rocky Young and New York’s Waleska Roldan. The neutrality of all three judges was a selling point in getting Hogan—a 34-year old Irish contender based out of Australia—traveling to Munguia’s home country for Saturday’s title fight, which streamed live on DAZN. However, just six of the 12 rounds were scored unanimously in Munguia’s first title fight in his home country. The controversy which ensued could factor into the hesitance of future potential opponents traveling to Mexico to face the unbeaten 22-year old Tijuana boxer. “We came here in good faith and no disrespect to the people who scored it but that decision shouldn’t go through,” Hogan (28-2-1, 7KOs) said in the aftermath of his first career title fight, one where many fans felt he did well enough to have won the crown. Instead, it was Munguia (33-0, 26KOs) who escaped with his unbeaten record and 154-pound title still intact. What doesn’t sit well with fans was the fact that he didn’t even need to sweep the final round on the scorecards in order to preserve victory. That he did win the 12th round on all three scorecards only widened already disputable scores. Rounds 3, 4, 6 and 12 were all scored unanimously for Munguia, while rounds 8 and 10 were swept by Hogan, whose 12-round win over Jimmy Kilrain Kelly last April earned him the mandatory title shot. Incredibly, his sweeping round 10 only pulled the visiting challenger even on two scorecards. Even worse, he needed a knockout to win in the eyes of Roldan, who remains forever infamous for her 117-111 scorecard in favor of welterweight Jeff Horn in his highly questionable 12-round decision over Manny Pacquiao in July ’17. Roldan didn’t do herself any favors on Saturday, scoring six of the first seven rounds for Munguia, the house fighter by culture and by promotion with Zanfer Promotions and Golden Boy Promotions having presented the show. Still, round two was the only of the 12 where she didn’t score in line with at least one other judge. That she had Munguia winning the frame raises questions, but she was in lock-step with Young and Levine for nine and eight rounds, respectively. Judges Roldan and Young both had Munguia winning rounds 1, 3, 5, 6, 7 and 12 in favor of Munguia, while awarding rounds 4, 8 and 10 to Hogan. She and Levine both had rounds 3, 5, 6, 9 and 12 in favor of Munguia and rounds 8, 10 and 11 for Hogan. Judges Young and Levine were on the same page for just seven of the 12 scored rounds. They both had Munguia winning rounds 3, 5, 6 and 12, while scoring rounds 2, 8 and 10 in favor of Hogan. The two boxers split the number of rounds in which one won by majority scoring. 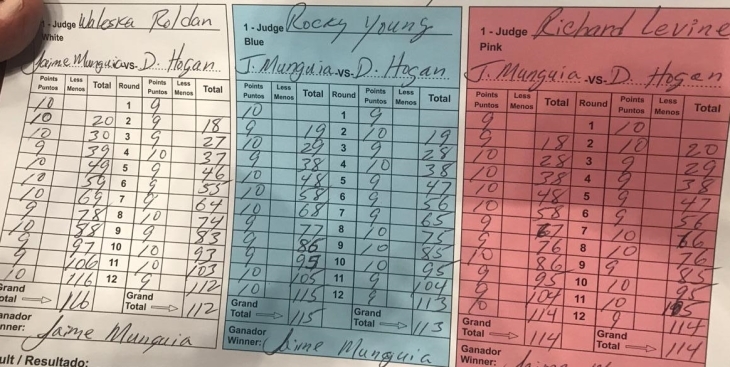 Rounds 1, 7 and 9 saw two of the three judges rule in favor of Munguia, while rounds 2, 4 and 11 scored similarly for Hogan. Most fans were in line with the 114-114 tally turned in by Levine, whose card doesn’t immediately reflect a smoking gun in terms of wrongly denying Hogan a win. Rounds 1 and 2 landing in favor of Munguia on Woldan’s card, however, willy surely raise eyebrows, as will Young scoring rounds 1 and 11 for the defending champion. Woldan had Hogan needing a knockout to win before the bell sounded to begin round 10, whereas the visiting challenger wouldn’t have fared any better than a draw on Young’s card even had he won the 12th and final round. Naturally, Hogan was adamant about getting a rematch. Such a ruling could come from the World Boxing Organization (WBO), whose 154-pound title was at stake and will likely field an official protest in the coming days. It’s doubtful that such a fight will be ordered, as scoring remains forever subjective—as was once again the case on Saturday in Monterrey. Mungia was exposed. If he moves up and fights GGG, he gets ktfo easily.